SpaceX's powerful Falcon Heavy rocket features a first stage that's basically three Falcon 9 rocket cores strapped together — meaning the big booster will have 27 Merlin engines firing in unison at liftoff. SpaceX will have to wait a bit longer to test its first Falcon Heavy rocket, as NASA and Air Force personnel stay home due to an ongoing U.S. government shutdown. The U.S. government shut down at 12:01 EST (0501 GMT) Jan. 20 after Congress was unable to finalize its spending bill, meaning nonessential government employees are staying home until things are resolved. This puts a temporary hold on many NASA operations and withholds personnel from SpaceX's planned test fire out of NASA's Kennedy Space Center in Florida. That engine test is a prerequisite for launching the rocket for the first time. "It also impacts critical missions for our customers, including important international allies scheduled to launch shortly from Cape Canaveral and Vandenberg Air Force Base, as well as upcoming missions this spring to resupply the International Space Station," he added. 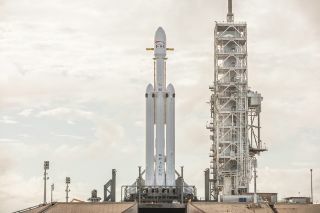 The Falcon Heavy was slated to launch at the end of the month, although delays in the static-fire test and these newest delays due to the shutdown will likely push that date further. The Air Force's 45th Space Wing, which supervises launches from Cape Canaveral Air Force Base, told The Verge it would not be able to support launches during the shutdown without critical employees. NASA's own projects will be affected, too: As Space.com reported on Jan. 19, nonessential NASA employees will be furloughed, which means their jobs will be suspended without pay. Officials whose work is critical to protecting the health and safety of humans or property, such as personnel operating the International Space Station or currently active satellites, will continue their work. ABC13 reported that mission control will remain in operation and astronauts on the station will go ahead with scheduled spacewalks (one of which happens tomorrow, Jan. 23), but those events may not be webcast for the public to watch as they normally would be. SpaceNews reported that coverage of the spacewalks was still being assessed Jan. 20. A running list of "space things" affected by the U.S. government shutdown created by Jason Davis and Emily Lakdawalla at The Planetary Society suggests that more than 600 full-time employees will be exempt from the shutdown to continue those critical operations. But the public won't hear much about it: NASA's website and social media accounts will not be updated, and all public events are cancelled or postponed. Depending on how long it lasts, the shutdown could have lasting effects on projects like NASA's James Webb Space Telescope, according to a report from Nature; the telescope must practice deploying its sun shield one more time before it is shipped to California for its final integration and testing, and that process would halt during a shutdown. Projects currently under contractors' work — such as the Transiting Exoplanet Survey Satellite, set to launch no earlier than March and currently with Orbital ATK in Dulles, Virginia — can continue work as long as they have their funding and don't need to consult with government employees. The Senate voted midday Monday to approve a bill that would end the shutdown. As of 1 p.m. EST (1800 GMT), the bill still had not been approved by the House of Representatives in order to reopen the government.